- the economic objective of attracting new buyers in order to have a market for the new art. I.Shishkin, N.Ghe (Gay), V.Perov, I.Kramskoy, I.Repin, V.Surikov, G.Myasoedov, L.Kamenev, A.Savrasov, Amosov, Ammon, M.P.Klodt, M.K.Klodt, I.Pryanishnikov, A.Bogolyubov, Gun (Huns), V.Makovskiy, N.Makovskiy, K.Makovskiy, V.Maksimov, P.Bryullov, K.Savitskiy, A.Kuindji, Bronnikov,V.Vasnetsov, A.Vasnetsov, Litovchenko, Lemokh, V.Polenov, Y.Volkov, Leman, Nevrev, A.Harlamov, N.Kuznetsov, Bodarevskiy, N.Dubovskoy, S.Svetoslavskiy, N.Shilder, A.Arkhipov, I.Levitan, I.Ostrouhov, Zagorskiy,K.Lebedev, A.Stepanov, Pozen, N.Kasatkin, S.Miloradovich, Shanks, V.Serov, N.Bogdanov-Belskiy, I.Bogdanov, A.Korin, I.Endogurov, M.Nesterov, V.Baksheev, Orlov, K.Kostandi. With the onset of the itinerant movement, new terms to describe Russian art began to be heard. Phrases such as "enlightening," "aesthetic objective," "economic objective," "new," "fresh," "for the first time" were heard all over the country. This was the first time in the history of the Russian world of art that the subject matter was rich and expansive. The method used by these artists was to conduct traveling art exhibits in Moscow, St. Petersburg, and other large cities throughout Russia. This set the Itinerants on a collision course with the forces of the Academy and set the stage for an entirely new type of art. Russian art has never looked back. Everyone in Russia became involved in the conflict. Critics, artists, academics, newspapers, politicians, and even the common people could not let the matter rest. Exhibition halls became battlegrounds between the new and the old. Today it is difficult to understand that the emotion of the times and the results of the movement clearly shook the forces of empire to their very depths. The itinerant artists themselves were from all walks of life and age. Some were peasants, and some were of the nobility, but all were united in a single goal. That goal was to depict life in Russia as it really was. The difference between this path and Classicism and Romanticism was that for the first time painting was focused on present day reality. The artist's hand was freed from the restrictions of lofty ideals. Painting reflected events and the contradictions of Russian society. The lives of common Russian people including their struggles against oppression were revealed through art. The love of the Russian people for their country and its nature was deified, and for the first time, paintings were free of social prejudice. One must be aware that all the while Russia, unlike other Western European countries, was a land where the political freedom to express oneself was strictly prohibited. Free expression was prohibited almost to the point of non-understanding in this country. It was only in the field of the arts (painting, literature, music, theater, etc.) that there was any possibility self expression. This led the Itinerants to feel as if they were given a special responsibility to effect change. The artists willingly took on this mission as a sacred duty. The great Ilya Repin wrote that artists come from the people and that the people expect art that reflects a clear understanding of conditions and nature. This generation of Itinerants tried to analyze and determine what art was and what role it played in social life. The great Russian art critic Vladimir Stasov defined this aspiration as follows: "The artists striving to unite to setup their own society were not doing it for the purpose of creating beautiful paintings and statues for the sole purpose of earning money. They were striving to create something for the minds and feelings of the people." This is why arguments that arose at the exhibition halls were concerned with far more than pure artistic arguments. The artists themselves were of varying talent, and different painting genres, but as members of the Society became "Universal Artists," who worked in different forms of art. For example, the most talented of the Itinerants (Repin, Shishkin , and others) worked in both painting and drawing. As a result of their efforts, easel drawing stopped being merely preparatory work for future paintings and developed into an independent form of art. 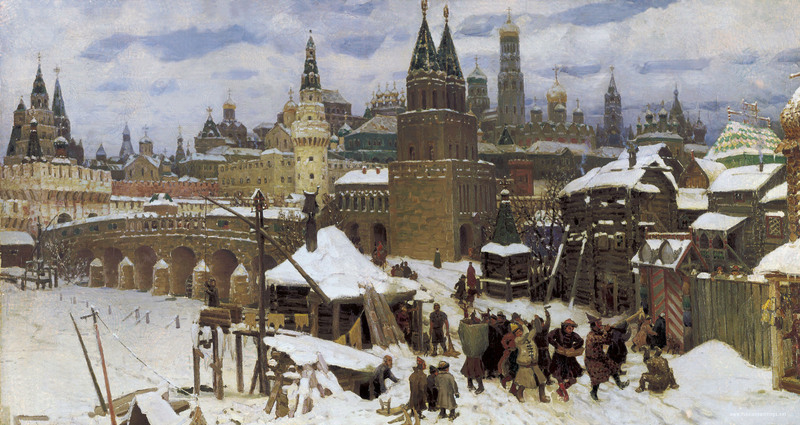 Other examples of multi-talented artists include artists such as Vasiliy Polenov and Victor Vasnetsov. These two Itinerants worked, not only as easel painters, but each also devoted a great deal of time in reviving theater scenery painting thus laying the foundation for the tradition of Russian theater decor that reached its peak at the turn of the 19th and 20th Centuries. This effort was done in conjunction with artists of another artistic society, the World of Art. Vasnetsov, among others, also created many mural paintings for churches. Being universal artists, many Itinerants worked successfully in other genres. Ivan Kramskoy, Nikolay Ghe, Ilya Repin, and Vasiliy Surikov were fine portraitists and history theme painters. 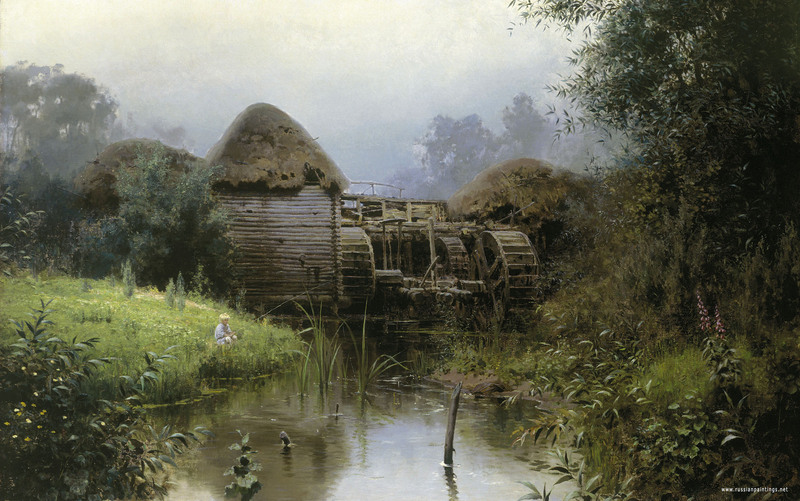 Vasiliy Polenov was an historical painter as well as a landscapist. Nikolay Yaroshenko worked in portrait, landscape, and genre painting. In spite of multi-talented artists that worked in many genres, one must not forget, subjects and heroes, the images of Russian nature and human destiny always remained the main themes of their creativity. While working on these motifs each artist revealed his own understanding of the fundamental problems of human existence. In order to comprehend the work of the Itinerants more fully, one must examine some of the new tendencies brought by the Itinerants to Russian art. Genre painting was the primary method of bringing realism to Russian art though it was not new for Russian art in the whole. The range of themes represented here was extremely wide, embracing studio works depicting everyday life in the city and peasant life in the country. In some instances huge paintings were created in order to accomplish these goals. Before serfdom was abolished by the reform act of 1861, peasants had belonged to a landlord. The liberation of the serfs entailed many new problems in society. The serfs were freed but were not given the right to own land. So, they had no means of support. Many serfs fled to the cities and into the arms of a miserable existence. They were no longer peasants but they did not find acceptance in the cities. They were no longer able to always maintain the ties that had previously bound them to their families. The villages they left behind were also changed. Customary ways of making a living were changed forever, and again family relations were affected. The peasantry became very heterogeneous and in some cases were able to engage in cottage industry that changed their relationship with the local nobility. 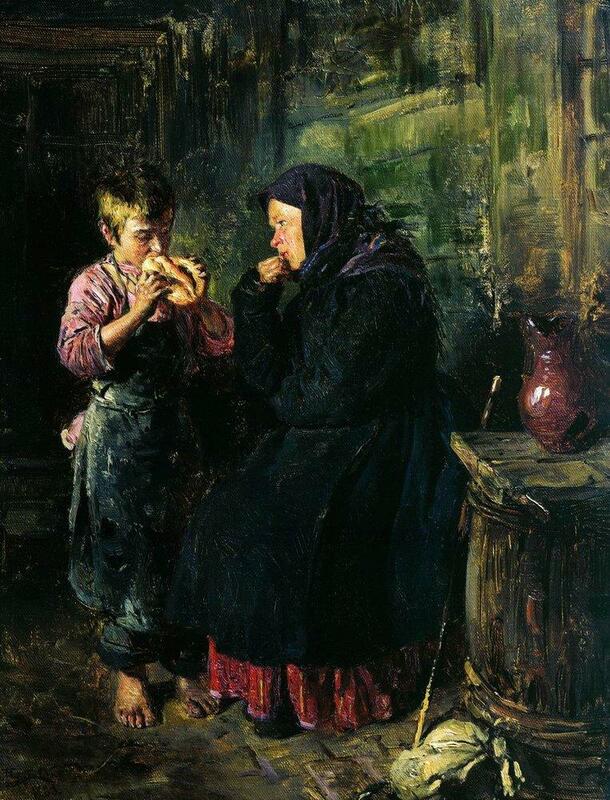 A classic painting by V.Maksimov, The Division of the Family Property is a sterling example of this change in Russian lifestyles. Vladimir Makovskiy, a very prolific artist dedicated his creative works to a reflection of urban life. His paintings The Date and On the Boulevard are perhaps his two best works. By depicting ordinary life he managed to reflect the deepest tragedies of contemporary society. The poverty of the most vulnerable members of society children and their miserable existence, mothers being doomed to the worst, the estrangement of sons totally exhausted by backbreaking labor were clearly recognizable in these two paintings. The Date is particularly remarkable. When viewing the painting, you can sense the same strain and emotional disconnect that you find in Date and On the Boulevard. At first glance nothing seems askance in either painting. You sense nothing amiss due to the lack of action or covert tension. You see two people sitting on a bench - one of them a young woman with a child, newly arrived from the village to visit her husband. Her husband sitting beside her has become a foreigner to his family and apparently has been so for sometime. The more you look the more you see of a tragedy slowly unfolding before your very eyes. 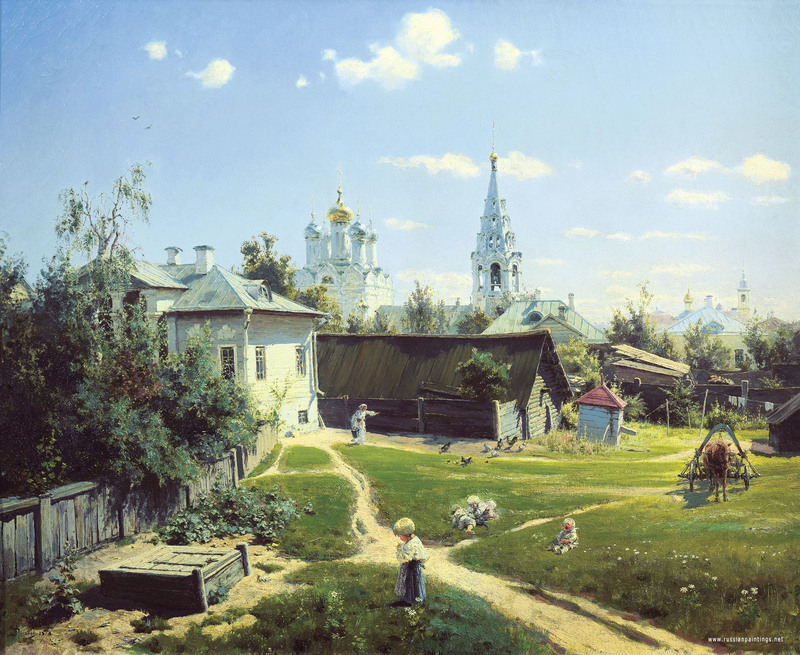 The viewer becomes aware of the contrast between the interplay of the people and the surrounding beauty of an August day on an old Moscow street, oblivious to the tragedy between the husband and wife. The oldest artist among the itinerants was Vasiliy Perov. His creativity played a special role in the establishment of Russian realism. In his painting Religious Procession on Easter that belongs to his early period, we can find a critical tendency, a typical feature of early realism. He criticizes priests that are to bring the faith to the people but actually do not deserve to be the Lord's pupils. Following a period of creativity, Perov tried to avoid a rude unmasking of people's sins and defects. He starts telling a sad story of contemporary reality. Seeing -off the Deceased is a story in art in which we can see the image of a peasant woman free from idealization. Her fate gains the sympathy and compassion of the viewer. The landscape in an artist's paintings starts playing a specific role in setting the mood of the whole painting. 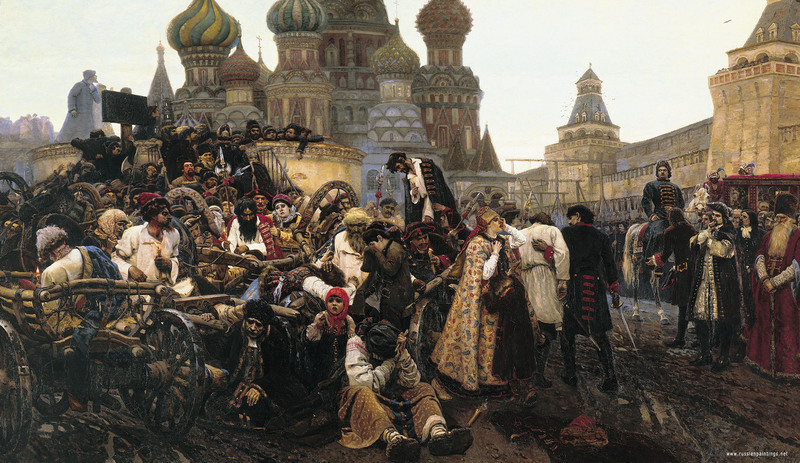 In the 1870s, Perov changed from sad and tragic subjects. He started depicting common people happy with their simple human joy and hobbies. He depicted fishermen, hunters on the Holt, and bemused duck hunters. The creative heritage of Ilya Repin plays a special role in genre painting and in Russian art as a whole. He is considered to be the most talented and famous Russian painter. His interests in painting were pointed mainly to contemporary subjects. He was interested in all aspects of Russian reality, but his talent was more fully revealed in genre and portrait painting. His works can be considered as an encyclopedia of Russian life with its heroes and events. 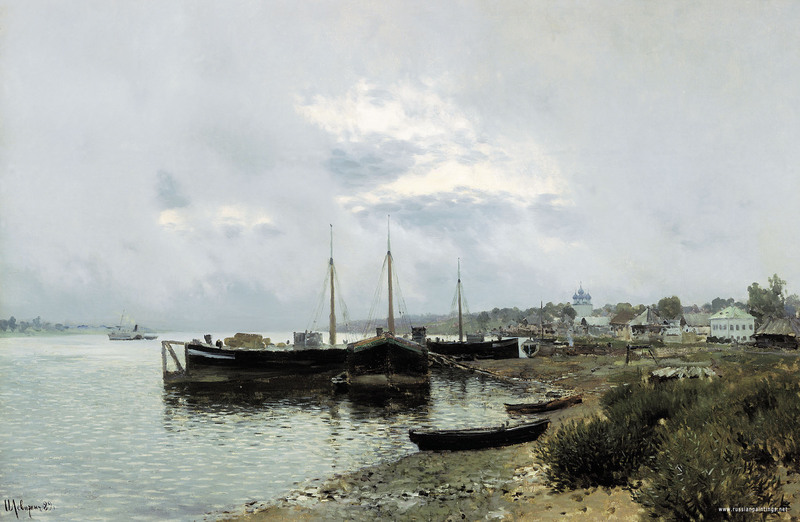 His first famous painting, 'Barge Haulers on the Volga', painted while he was a student of the Academy of Fine Arts, showed his talent and characteristic manner of work. 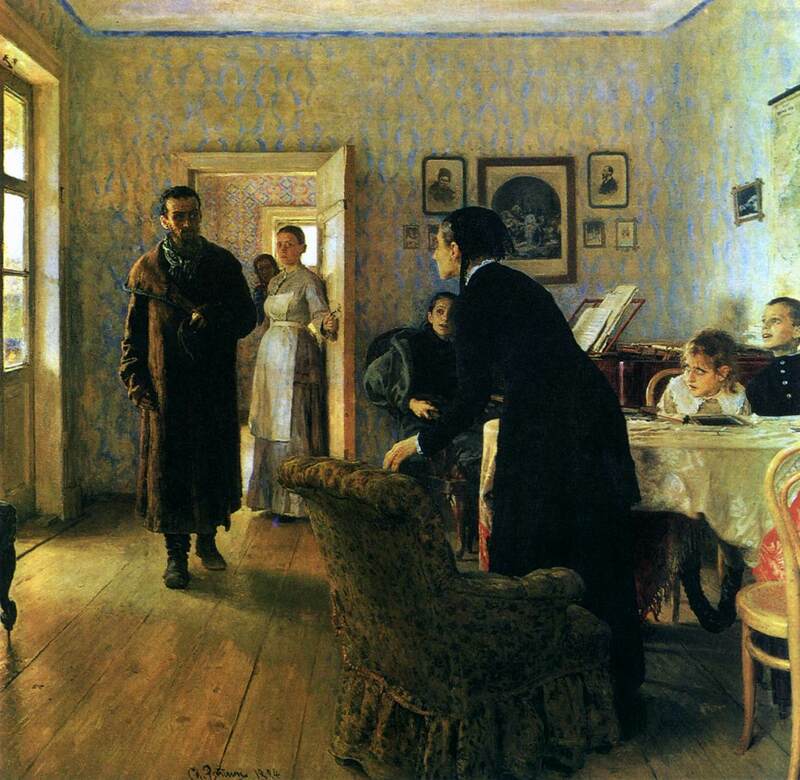 Unlike the artists who had treated this subject before, Repin was much more interested in the participants of the scene. He wanted the viewers to see their fates and personalities more than the hard labor they were forced to perform. He was the first in the history of art who tried to peer into people's faces to understand who they were. For the first time a common Russian man was depicted as a hero of artistic work. He didn't idealize his heroes but tried to demonstrate their personality. For the first time people could see a group portrait of miserable and humiliated Russian people. Such an artist's aspiration to concentrate attention on the psychology of the bargemen was always Repin's characteristic feature. 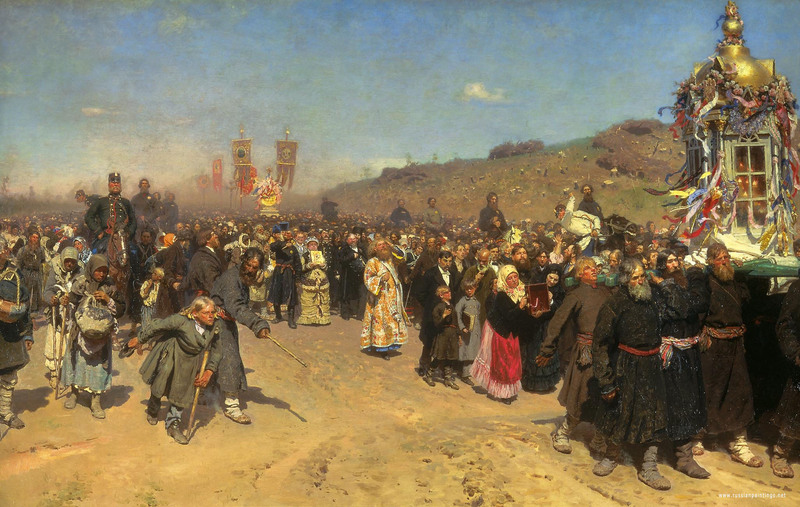 Another illustration of this was his painting Religious Procession in Kursk Province. This painting is very typical of Ilya Repin and is remarkable for its characteristic details of that time. Being a talented artist he had a wonderfully keen feeling of the main idea that needed to be expressed. 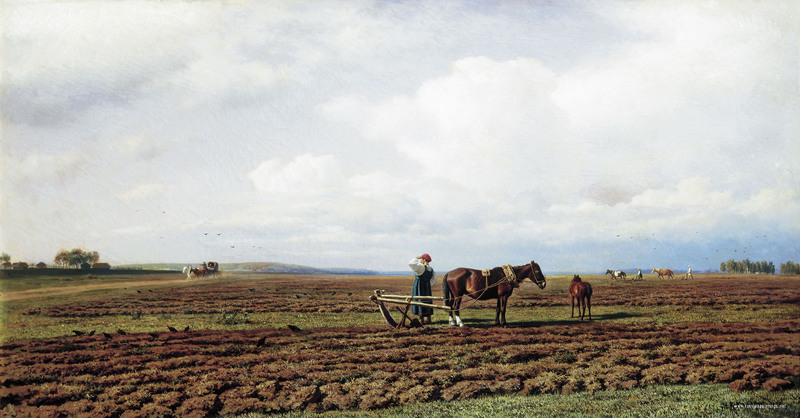 One of the features of art of the 1870-80s was the tendency to create big monumental works whereby a person viewing the one life depicted on the canvas could analyze present day reality and see the whole historical epoch of the Russian people. This technique illustrated that genre painting proved to be as powerful and as important as historical painting. 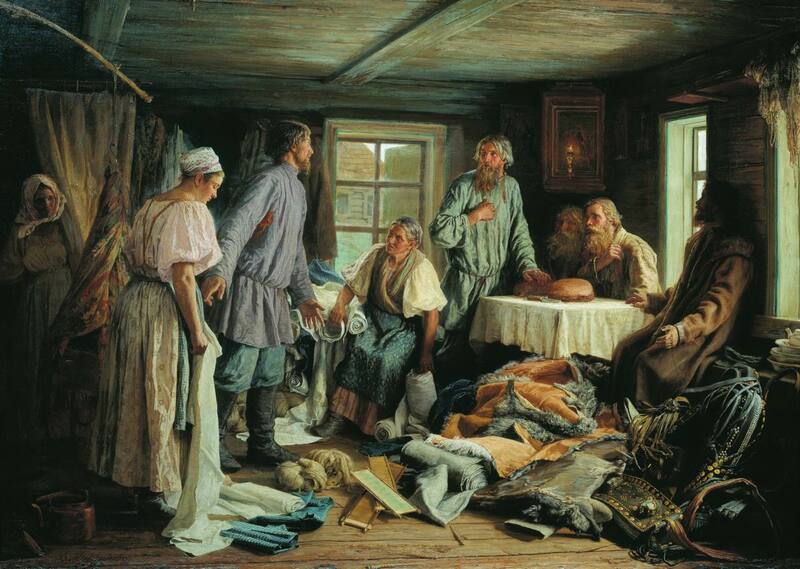 Genre paintings illustrated the life of the Russian province, in both events and in human portraits. The action in Religious Procession in Kursk Province takes place in a province famous for its dense forests, but in the picture we can see only stumps left after the trees had been cut down. Modern man's activity resulted in the destruction of nature. We see crowds of people marching along the dusty road. The composition was arranged in such a way that we almost feel the crowd moving forward, about to crush the spectator. Real religious faith can be read on the faces of heroes depicted on the left of the canvas and especially in the face of the hunchback on the foreground. Note that he is pushed aside by the policeman riding a horse because this poor cripple might disturb rich people proceeding along the road. (Didn't Christ say we are all equal before him?) The painting shows us two extremes: superficial, cold, hypocritical religious feelings on the right half and true believers in God in the left half of the painting. These people are rejected by this insincere society on the left part of the painting. By paying such attention to the individuality of a person, Repin displays the great variety of types and characters of his heroes. In the foreground we see a rich merchant woman avidly holding a icon. She is drawn into arrogance, clearly breaking a main tenet of Christianity. We can spend hours examining the painting whereby the motley crowd is represented as an integral part of the Russian people. 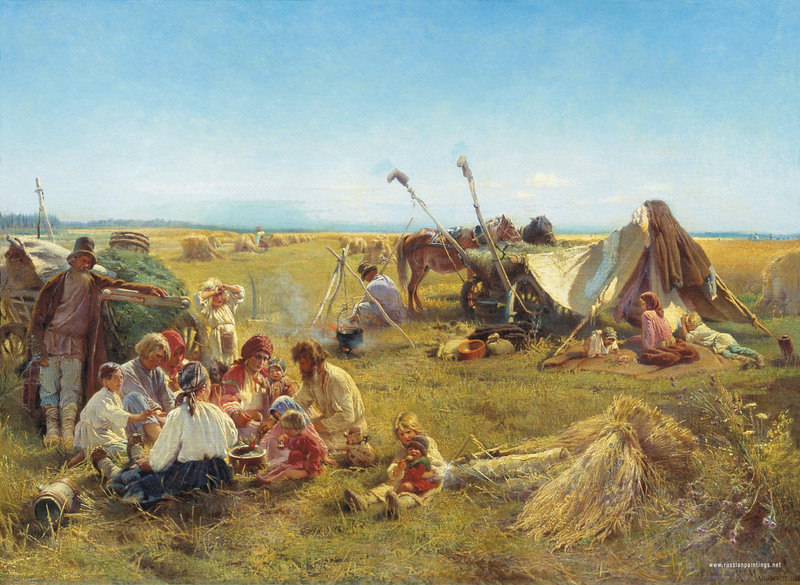 Painting present day reality, Ilya Repin managed to reveal a new social phenomena by using new participants. He was an artist forever seeking new subjects, themes, images and means of expression. Many times in his paintings he addressed new social and political moods and, of course, revolutionary events. The policy of terror carried out by several revolutionary organizations entailed cruel murders of some prominent politicians and the assassination of Emperor Alexander II in 1881. This consequently resulted in extremely strict and bloody responses by the Government. As the country became more and more submerged in the blood of innocent victims, the attitude towards revolutionaries gradually changed in the society. Art in this matter absorbed and reflected all topical ideas. Initially revolutionary activity was often compared with the excruciating life and death of the saints of the Gospel who sacrificed their lives for faith. Repin was affected by these ideas, and he painted his Refusal to Confess which glorified fanatical ideas of the day. Afterwards he conceived the idea of another work They did not expect him, a story about the return of an exiled convict. The interesting thing is that originally Ilya Repin planned for a woman to be the main actor in the painting, as women were fighting for these new ideas next to men. Later the artist gave up this idea having considered that it would add some sentimental aspect to the painting. Besides, he realized that the question of the main hero was not so relevant compared to the subject itself. Terrorists were ready to die for the sake of the idea and for the sake of their loved ones. Did these loved ones want such a sacrifice to be made? How did relatives meet these returning anarchists after being separated for decades? Repin's contemporaries usually associated this painting with the parable of the return of the prodigal son. None of the artists expressed an opinion, thus making the viewer decide the destiny of the hero. Bloody events of reality had not always been reflected directly in genre painting. The background of Ilya Repin's Ivan the Terrible and his son Ivan was an expression of the artist's feeling of the atmosphere and smell of spilled blood in the room where Ivan the Terrible is holding the head of his son. A son he had just struck in the head with a stave and murdered in a fit of temper. Another painting Nicholas from Mirl, calls for love and forgiveness and shows us how the main hero, Saint Nikolay, intervenes at an execution and saves the lives of people sentenced to death. In the 1870-80's historical painting for the first time seemed to reveal all answers to relevant questions addressed by the past. Popular revolts, acts of terrorism, execution, heroic deeds, sacrifice, suffering, betrayal, faithfulness to ideas and treachery are the concepts dominating the society of that time. Some artists approached these problems via religious subjects, very familiar and clear to Russian people. Nikolay Ghe, was one of them. 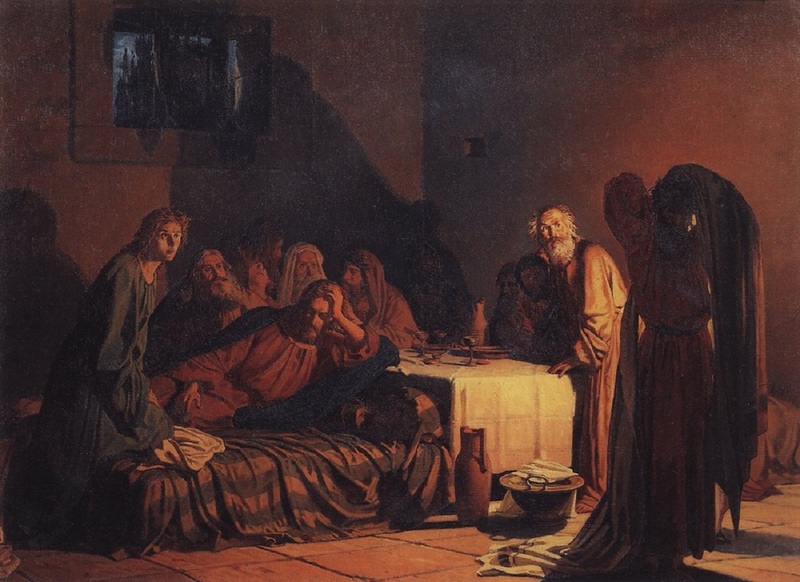 His work, The Last Supper, lacked mystery and sacred meaning. Like-minded people had become enemies. Judas, who thought of the salvation of his people, did not grasp the great idea of Christ providing salvation for the whole of mankind. The philosophic disagreement, but not the betrayal of a greedy man, became the subject of the painting. (Note there are only 11 Apostles depicted in the painting and that Judas looks like a winged Angel of Death.) His works, Calvary and Crucifixion, were dedicated to humanity, at a time when spiritual strength and faithfulness to ideas overcome physical suffering. 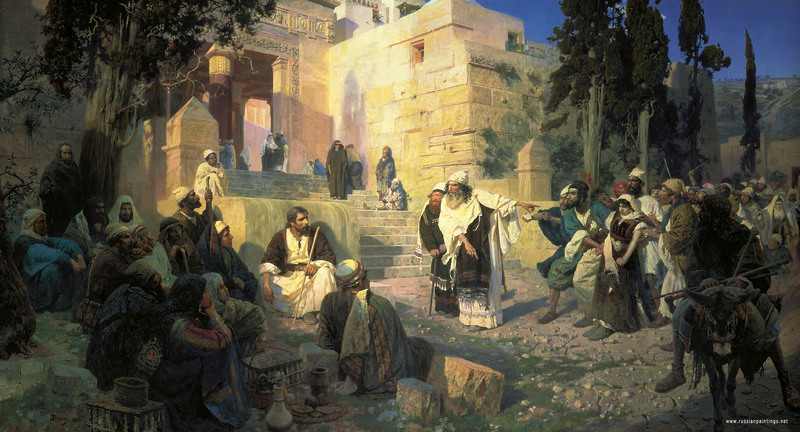 Ivan Kramskoy, also painted religious subjects. 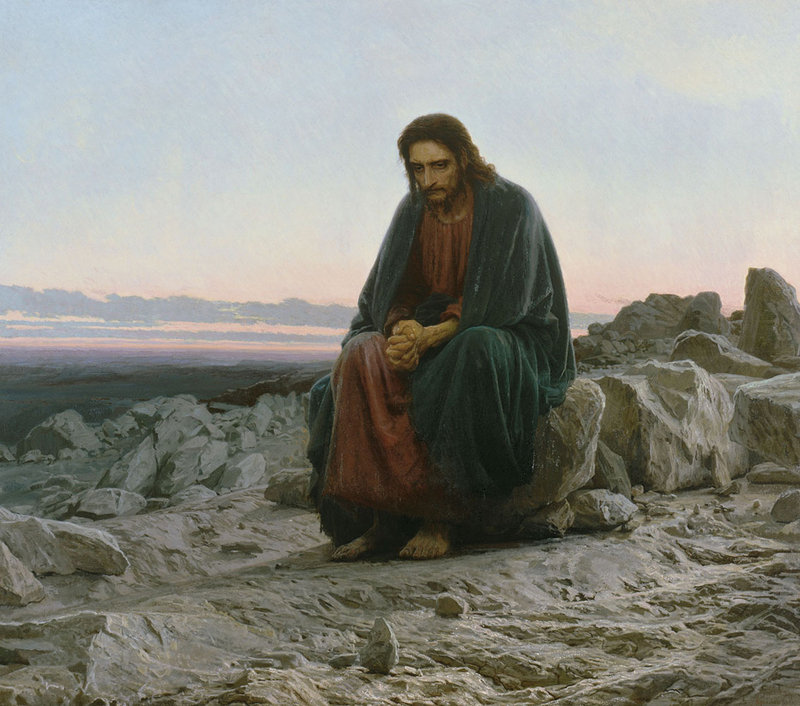 In his work, Christ in a Desert, he shows the hero at the moment of making a choice of his life's way. This feeling of choice was familiar to many people: whether to remain faithful to destiny or to yield to temptation and retreat, having foreseen terrible consequences of remaining steadfast. All his life Kramskoy was devoted to a large painting called, Christ before the people, where he interpreted the subject of sacrifice and suffering for a people that did not understand. Vasiliy Surikov's, most famous work is his trilogy painted in the 1880s. Each of these three paintings is devoted to a specific epic collision of paramount significance: The Morning of the Execution of the Streltsi, represents the nation in history. Menshikov in Berezovo, depicts a hero in history. Finally, the Boyarynya Morozova, is an example of a hero and the people. Vasiliy Surikov approached the most dramatic points of Russian history: reformation of the church in the mid 17th century, Peter the Great's reforms of the 18th century, etc. 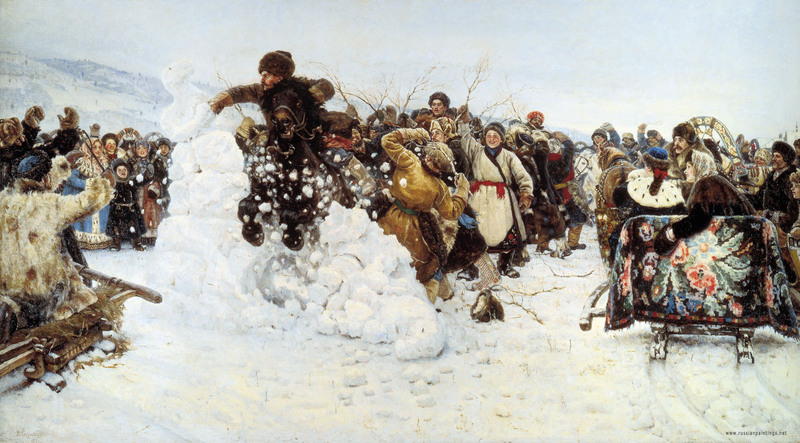 In Surikov's own time, the late 19th century, there were numerous flashbacks of those events in Russia. The nation found itself on the threshold of major changes once again. 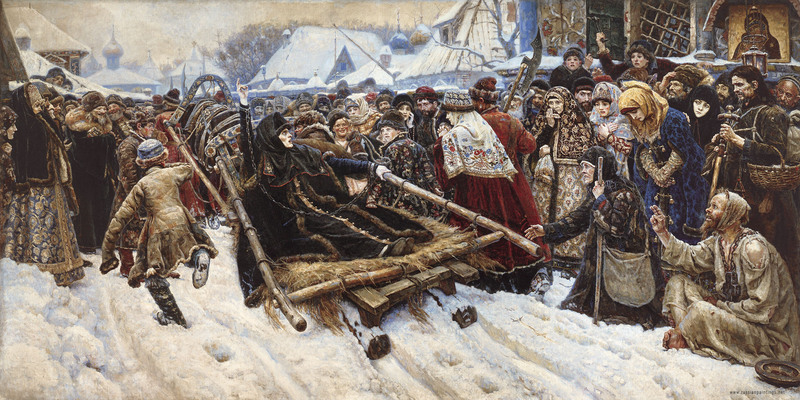 Incidentally, Surikov in his Morning, showed for the first time how an historical inevitability can divide a single nation, turning fellow countrymen against each other. In the painting, one of Peter's soldiers is carefully supporting a strelets (a member of Ivan the Terrible's elite corps) while leading him to scaffold. These two Russians are not enemies, only a historical coincidence has turned one of them into a hangman and the other into his victim. Could Surikov have foreseen that twenty years later Russia would be flooded with blood once again, and brother would turn against brother in a civil war? He looked to the past for answers about Russia's future. Surikov neither passed judgment nor took sides in his paintings, and his characters were neither saints nor criminals. Each of them was convinced he was doing the right thing, but in the eyes of history, "right" is synonymous with "imperative." It is the inevitable collision of historical interest entailing the death of one of the parties that the artist rendered with disturbing vividness. Relying on his creative imagination, the artist craftily conjured up pictures of the past, encouraging the viewer to ponder traumatic historical collisions that had once shaken the nation, compelling every person then living to make his choice. His task was to make his characters convincing and historically credible, to make the viewer believe in the image before his eyes. In later years, Surikov abandoned his preoccupation with dramatic turning points in history in favor of glorifying Russia's heroic past. In spite of this he remained true to himself: the Russian people were still the main character of his works, and courage and daring were the artist's principal subject-matter. In his paintings, Surikov always focused on fine portraiture. His female images are particularly elaborate and masterful. 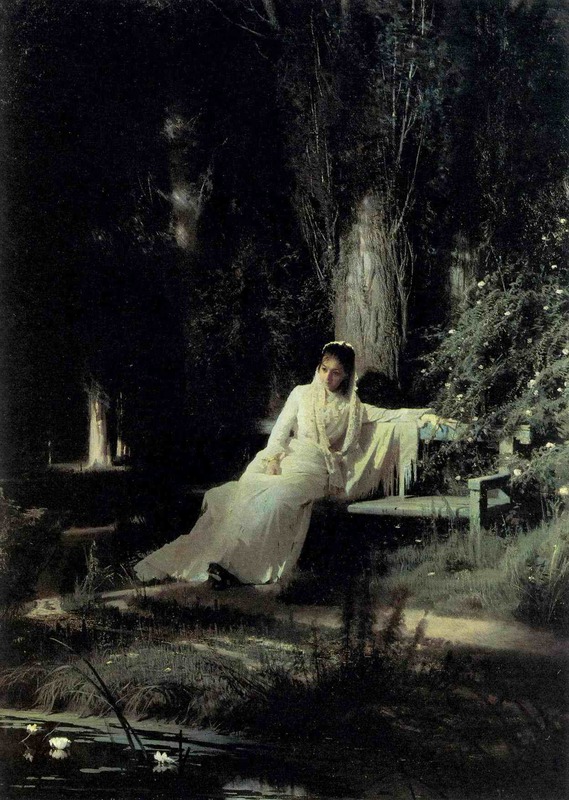 He appreciated and knew how to depict the beauty of a Russian woman; he understood her contradictory personality, her tenderness, kindness, compassion, cordiality, quiet resignation, and readiness to sacrifice herself, and he recognized that sometimes, her courage, strong will, devil-may-care attitude, and her strong convictions bordered on fanaticism. During that epoch - the heyday of portrait genre in Russian art - many artists tended to emphasize their characters' personalities in their historical and genre painting. Itinerants made a particularly notable contribution to portraiture. For the first time in Russian art, portraiture stopped being merely the art of painting family members and stopped serving exclusively the sentimental needs and vanity of individuals and families. As a result of the itinerants, the very word portrait acquires new understanding. The reason for the above we find in the definition of reconsidered art that achieved vivid social status. Portraits became very regulated such as the portraits of contemporary heroes, public figures, common people, peasants, and workers. Art changed much. Now it served more for exhibition purposes rather than purely as private commissions. The name of Pavel Tretyakov, is closely connected with establishment of this new art destination. He was a Moscow merchant who had decided to set up a gallery of the national modern art. He started buying itinerants' work, not only at the exhibitions, but also unfinished works while they were in an artist's studio. Tretyakov attended artists' workshops and often paid money to an artist in order for him to complete the work. Moreover, he commissioned different artists to make portraits of writers, musicians, actors, and other artists in order to leave a cultural heritage for the generations to come. His life and the life of his family were very modest as most of his money was spent for paintings. Being so interested in portraiture, he got other artists interested in this genre. Among the artists working in portrait genre there are several outstanding masters whose names are worthy of mention. Vasiliy Perov was the first who featured mostly in psychological portrait the complicated inner world of the person and his soul. His portraits of Feodor Dostoevskiy and of Alexey Ostrovskiy are considered to be his best and most famous portraits. The portrait of Dostoevskiy, a great Russian writer who tried to penetrate the darkest parts of a human soul, is of special value. 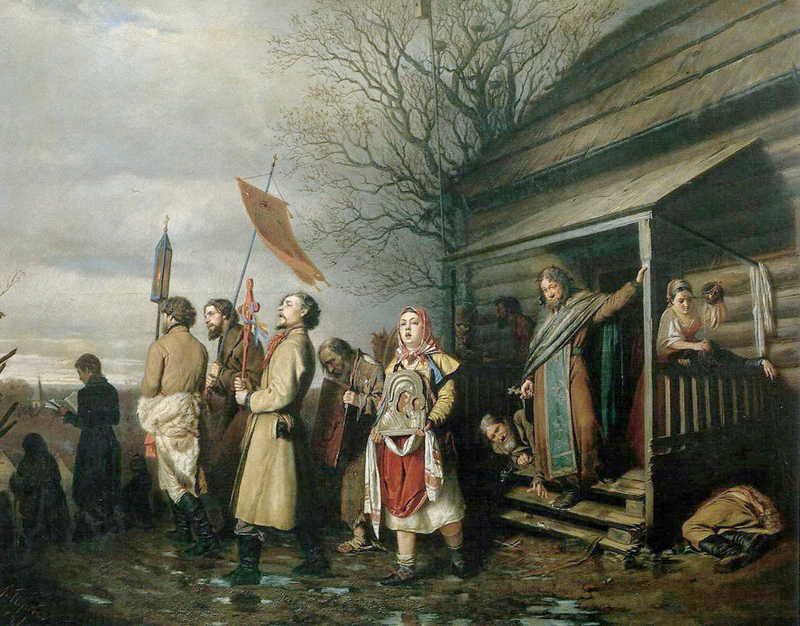 Kramskoy used this painting to reflect his own understanding of duty and honor of Russian intelligence. He strove to reveal the versatile personality of the writer. Ivan Kramskoy, being a very talented portraitist, was a prominent public figure and art was not the only domain of his activity. Kramskoy was the head of the Society of Traveling Art Exhibitions from the time it was established. His particular understanding of art as a way of educating people dictated his individual choice of the model and interpretation of his portrait image. He chose those whom he considered to be an ideal subject and who shared his views on the exclusive educational mission of art. His views coincided with general trends and objectives in art - a search of the identifiable person. The resulting form of the above social significance of a model was of particular importance for Kramskoy. A fine example of this approach is the portrait of L.Tolstoy. The ascetic simplicity of the writer's image and feeling of serious, dramatic thought that dominated Tolstoy was reflected in Ivan Kramskoy's opinion on the writer's destiny. 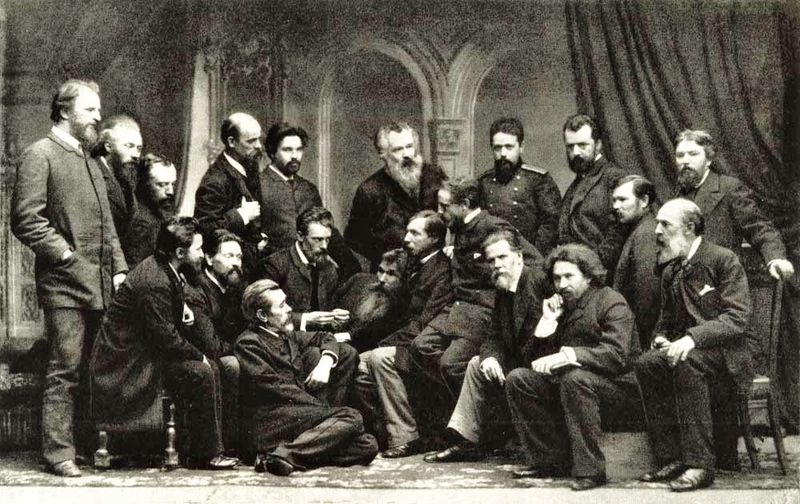 After the death of Ivan Kramskoy, Nikolay Yaroshenko, who was called "the conscience of the Itinerants" for his integrity and adherence to principles, headed the itinerants' society. Yaroshenko created his own portrait type, and his representation of a specific model became the basis for his generalized image of the representation of the different layers of society. Girl Student, is typical of Yaroshenko. His Portrait of Pelageya Strepetovo, a Russian tragical actress, is a very good example of his work. She specialized in the roles of the poor and humiliated, exhausted by life women, and these roles left their mark on this portrait. Looking at the clenched hands of this fine, young, but not pretty woman, we can feel her inner strength and the emotional strain in her image. This image probably reminded contemporaries of young girls exiled to the mines for expressing their ideas. One critic noted the resemblance of bracelets on her wrists to fetters. As has been mentioned, the most famous among the portraitists was Ilya Repin. He saw the souls of every person who posed for him, and he destroyed all conventional rules adhered to by other portraitists. He was unsurpassed as a master of any form of portrait from bedchamber to state portraits. He worked both in painting and drawing. The backgrounds for his portraits could be a house interior or landscapes. Using particular composition, color schemes, lines, and strokes, he underlined unique individual features of the model. 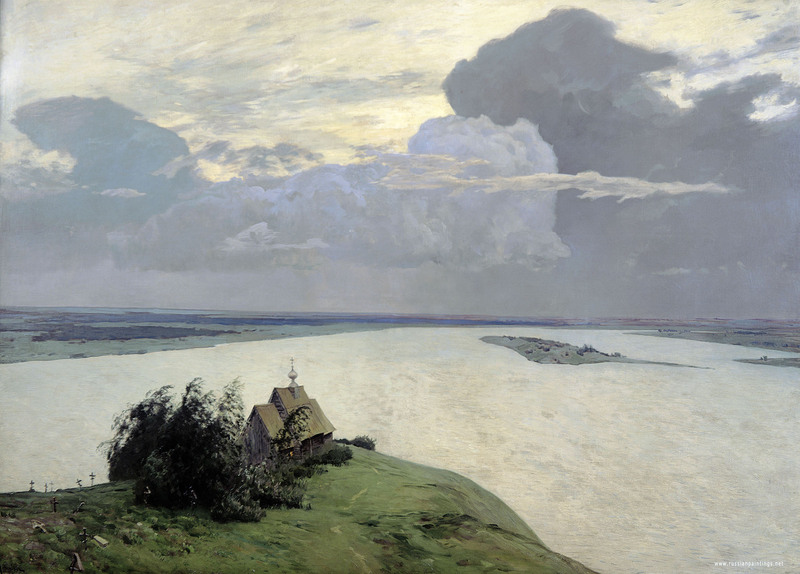 The German poet, Rilke, said: "Repin has the nature of an artist. With a glance, he inspects everyone he meets, studies him and assigns him to remote corners of his soul and doesn't let him move away until Rapin is finished." 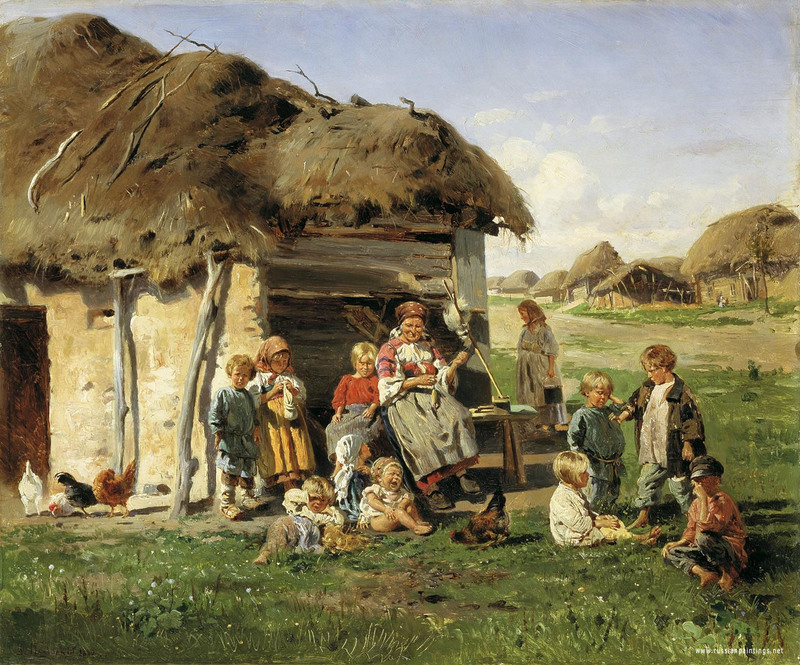 Repin models came from all types of society to include peasants as well as the aristocracy. He painted men, women, old people, children, friends and relatives. The fine portraiture of Ilya Repin gives us an integral, profound, all-embracing, general presentation of 19th Century society and lively individual images of its representatives. Many admire the works of Repin. Especially fine paintings include Fall Bouquet, Portrait of artist's daughter, Portrait of M. Musorgsky, and the Portrait of Ivan Kramskoy... The list of works is endless. 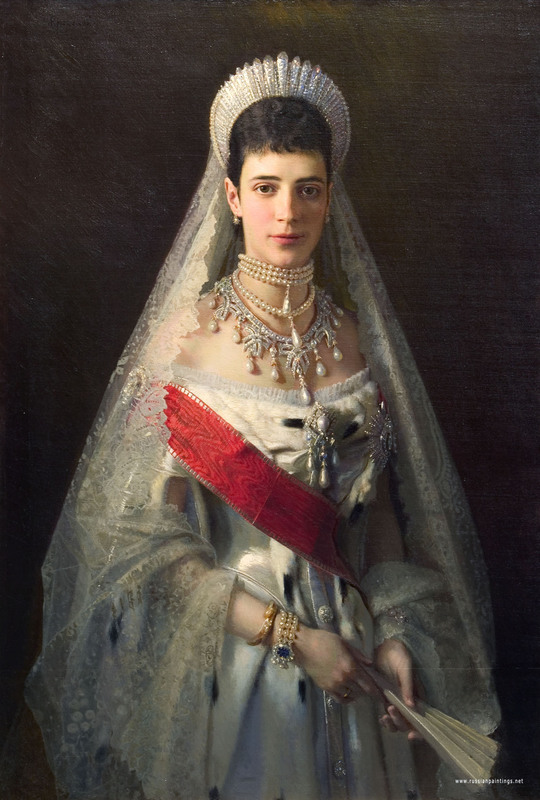 In the history of Russian art, the portraiture genre is one of the oldest and most traditional genres. First introduced at the time of Peter the Great, it was developed by different generations of artists, but it was the itinerants that made a particularly notable contribution to portraiture. They were also great innovators in Landscape genre. Another important concept of the specific national character of Russia, the peculiarity of Russian nature, was done for the first time by Itinerants. 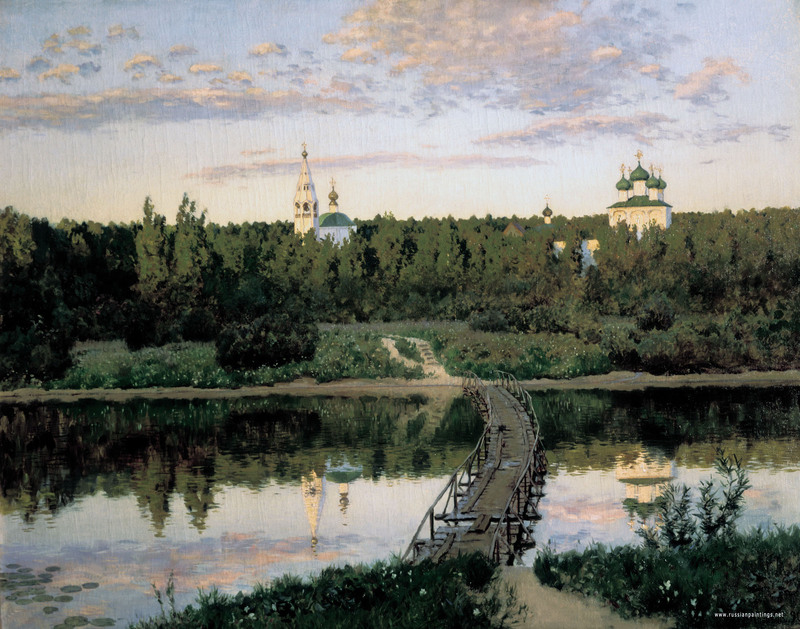 Works by Alexey Savrasov, Ivan Shishkin , Vasiliy Polenov, Arkhip Kuinji, and Isaak Levitan were wildly received by the public. These masters showed the highest importance of ordinary motifs, scenes, and seasons of the year country sights were approached by artists much more often than urban motifs, thus emphasizing peasant themes. But it was not based purely on social problems. The whole gamut was captured on canvas. Green plain expanses, fallowed fields in the rain, endless travel-worn roads, narrow paths that stretched from different parts of the vast land, dense forests, impassable thickets, small lakes like blue saucers, hidden copses, and the beauty of the big Russian river Volga were all acceptable subjects for these Russian immortals. 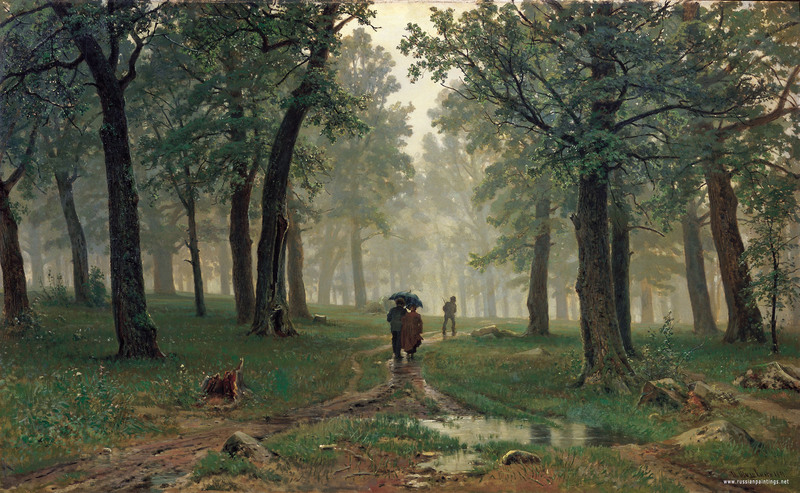 The concept of nature, for Russian Itinerant artists and since, has always been closely connected with a man being painted in his natural environment. 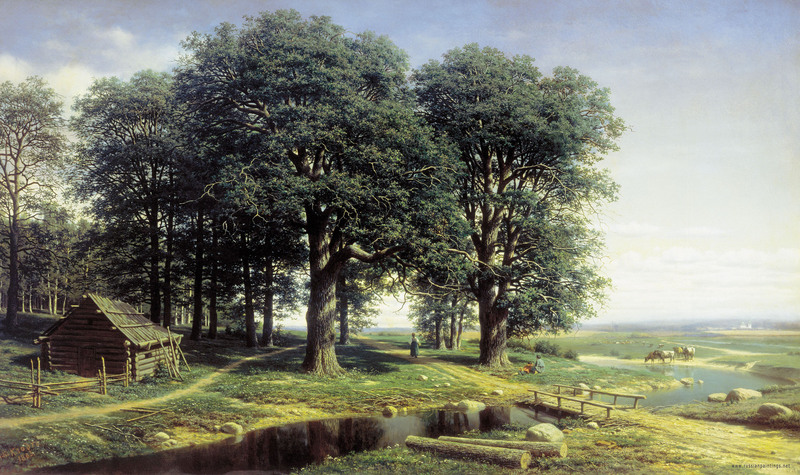 Concerns about people and their thoughts and the Russian character were very much affected by landscape. The narrations about Russian nature indeed involved the telling of the life story of human beings living in nature. 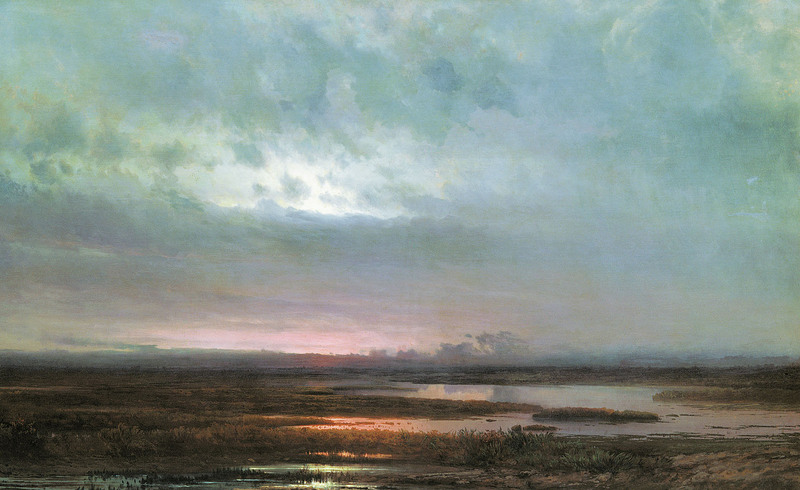 One of the first among itinerant landscape artists was Alexey Savrasov. 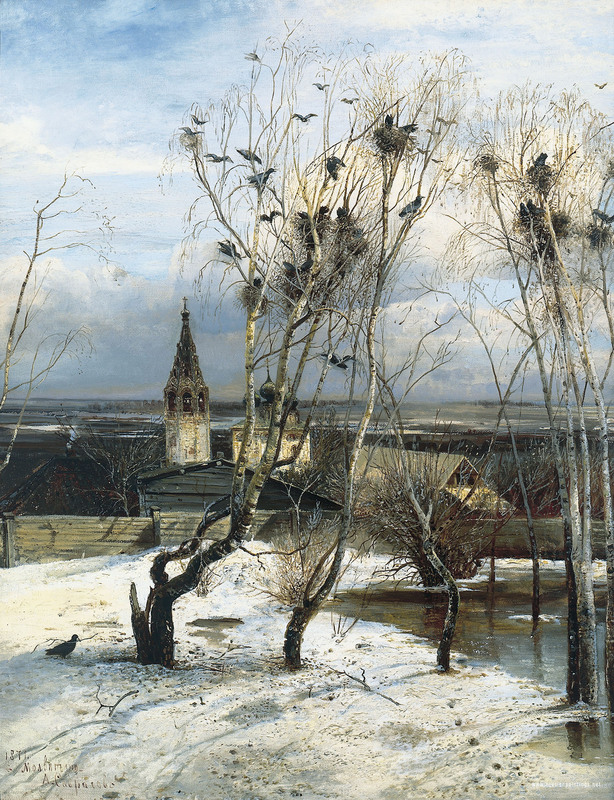 His painting, Rooks Are Back Again, was exhibited for the first time at the exhibition of 1871 and it amazed viewers. For the first time they saw a plain native landscape far removed from the flourishing Italian beauty typical of classical and romantic artists. A feeling of nature awakening after winter, as a tree with its bared branches is depicted standing in the distance, soft light coming from the blue sky, a bustle of the first birds, all combined to evoke a feeling of something dear to one's heart.... a familiar scene dating back to childhood. This sentimental landscape gained high significance in this genre. Each painter approached similar motifs in his own artistic manner. 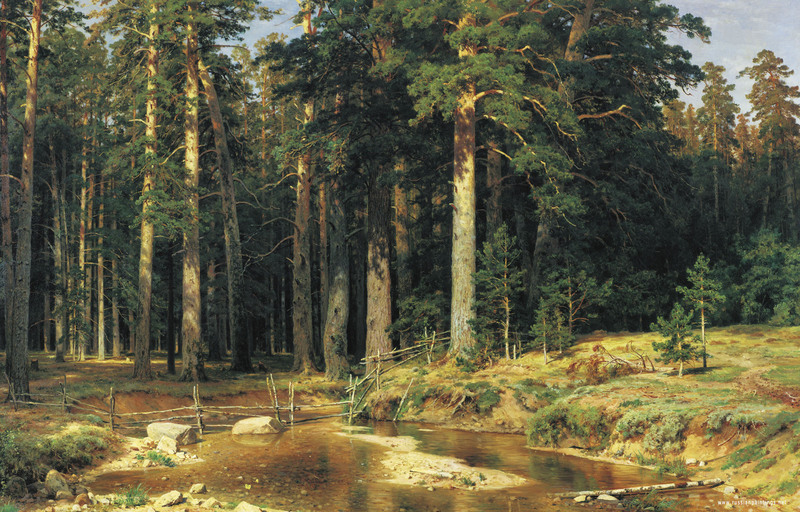 Ivan Shishkin in his works glorified the heroic spirit of the Russian land. He liked to emphasize the might and grandeur of Russian nature. Depicting mostly fields and forests, he was given an artistic name of "singer of fields and forests." His selfless love of nature made him not only an artist, but a botanist as well. He refused to be inaccurate depicting tree or blade. Numerous studies and sketches that survived till today offer testimony concerning his great care in studying nature. 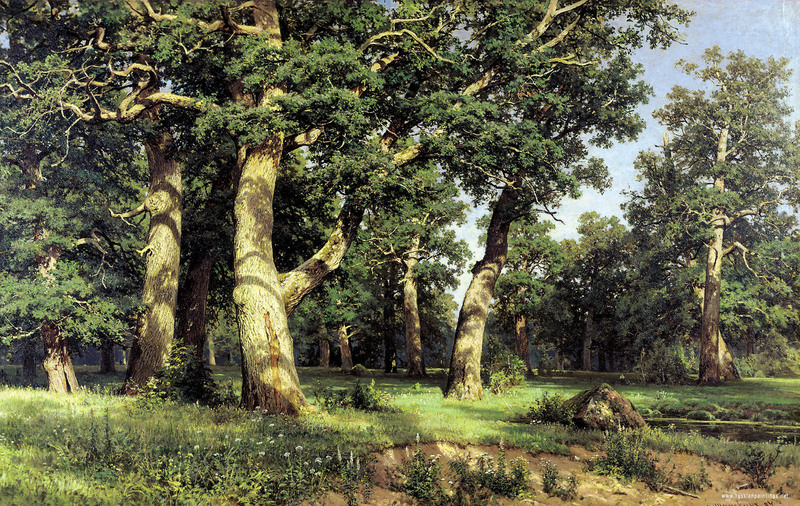 Although Ivan Shishkin was often criticized for his naturalism and his unreasonable standards in his representation of nature, the careful work at the details of his paintings can't be called "naturalism." Naturalism in painting means blind imitation of a natural view without a well thought-out composition and without the correlation of common details and a particular selection of the items painted. 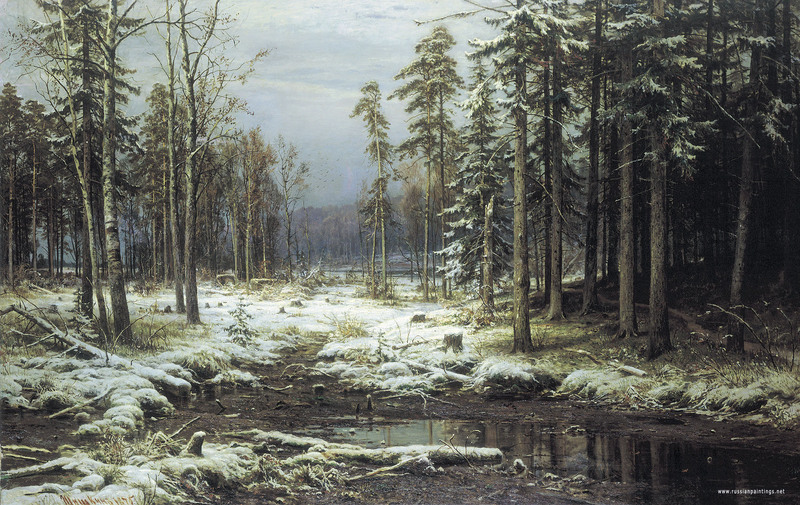 At first sight, Shishkin's landscapes look so trustworthy that one can get the wrong impression of the artist's work. The artist desires the viewer to believe in the reality of such an existing view. 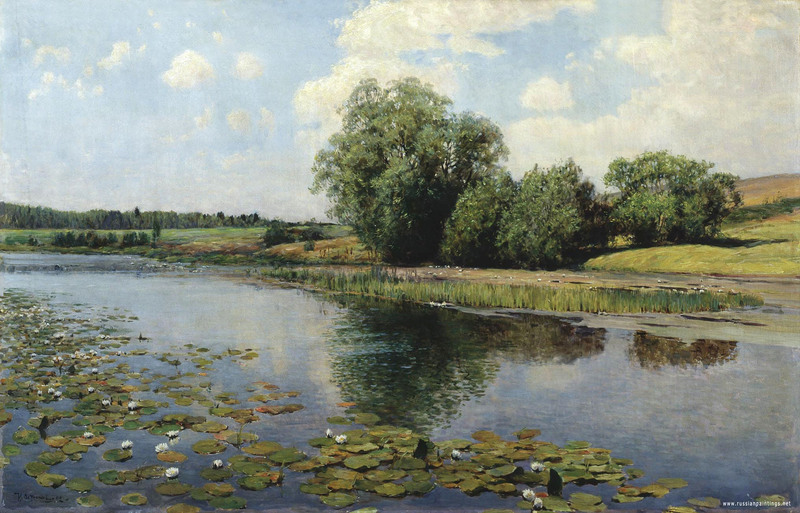 In this connection, his painting, The Rye, is very typical. 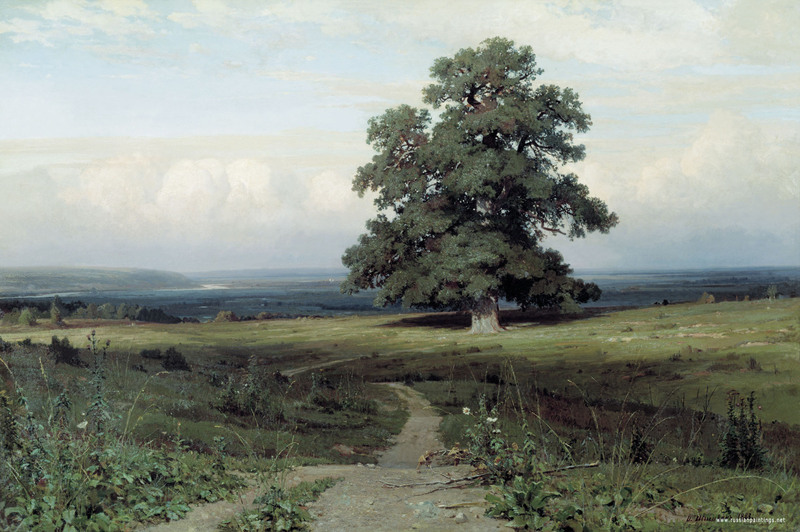 The artist selected the typical natural motives of a central Russian landscape: the field of rye, the road, and mighty oaks. Next he thought about the composition, trying to get the right correlation between the sky and the earth, the fore and background, as well as the right light combination. All these details create mighty images that affect the feelings of the viewer. In this painting the artist truly glorifies the true beauty and grandeur of Russian nature. One must give credit to the Itinerants for the creation of the genre of "plein air" painting. 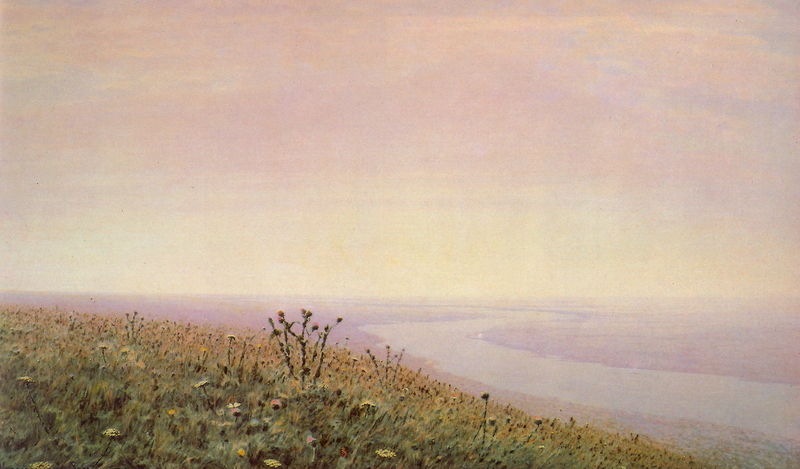 Two of the best were Polenov and Levitan. 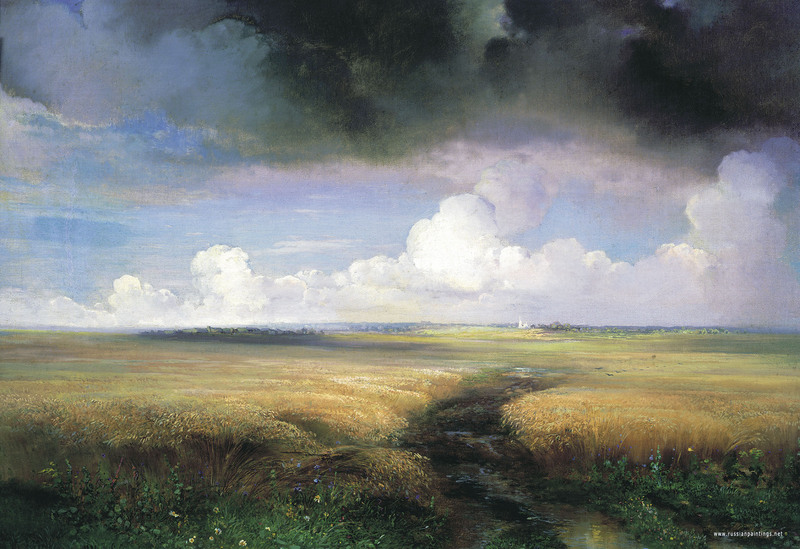 Polenov's artistic manner was much different from that of Shishkin . In his paintings Moscow Courtyard and Grandmother's Garden, he acts as a delicate lyric, entertaining storyteller. For the first time in these paintings he demonstrated the principles of so-called "plain-air painting." 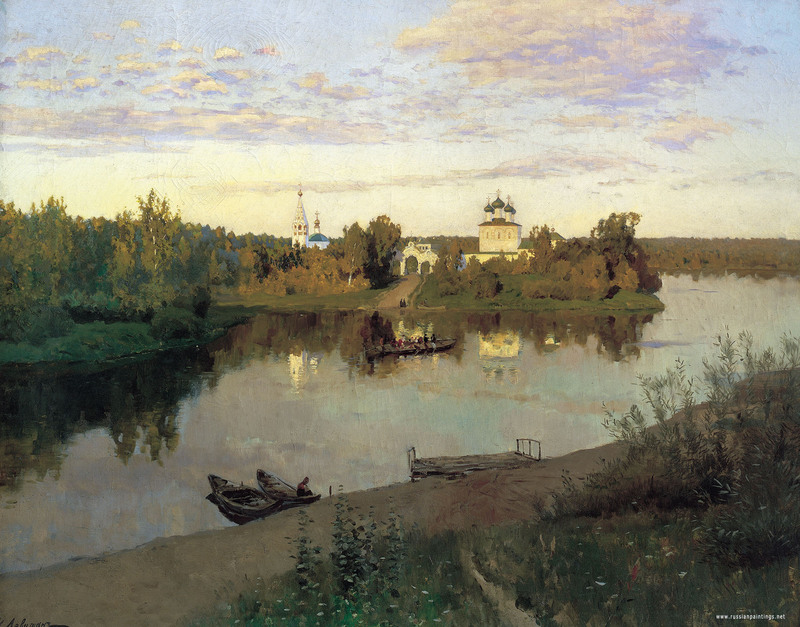 However, the greatest "plein air" landscape painter in Russian art was Levitan. 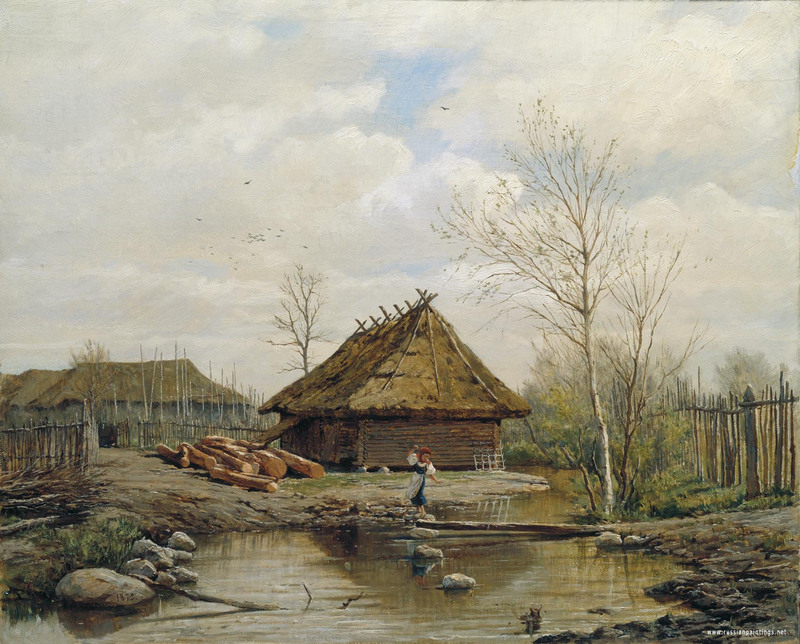 Considering the power and might of his talent and his contribution to the landscape genre he can be compared with Repin. His huge creative legacy gives an idea about the broad scope of his interests in the landscape field. Some of his works are full of delicate lyrics while others have epic and broad generalizations. 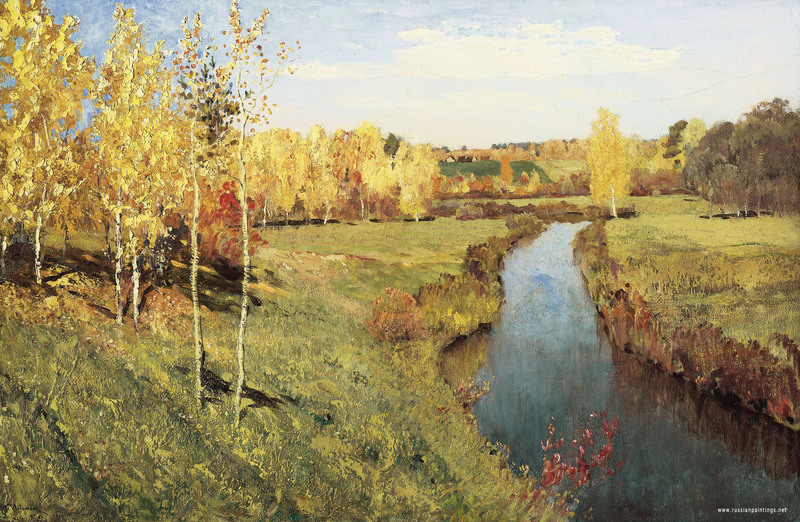 Issak Levitan had a very profound understanding of nature. Nature in his opinion holds onto its inner content. He said, "Can anything be more tragic than to feel the endless beauty of surroundings, the concealed secrets of nature, to see the Lord in everything and have no possibility to express such deep emotions?" These words reveal the modesty of the artist who has created real masterpieces but was not satisfied with himself and who worried about his inability to achieve perfection. Levitan confirmed once again that Russian landscape art demands to be considered as an object of the highest ideals of art. Many of his paintings contain a reflection on people's destiny and the meaning of their life. His paintings are full of literary associations and philosophical ideas such as Over Eternal Peace, and Eternal Chime. In an entirely different manner he created landscapes in natural beauty, illustrating the waking up of nature March and the fading of nature in Golden Autumn. Issak Levitan painted typical Russian landscapes, reproducing different states of nature correlating with human emotions. The pictorial freedom of Levitan's creative manner made him different from other landscape painters of his time. His last painting, Russia, was not finished. 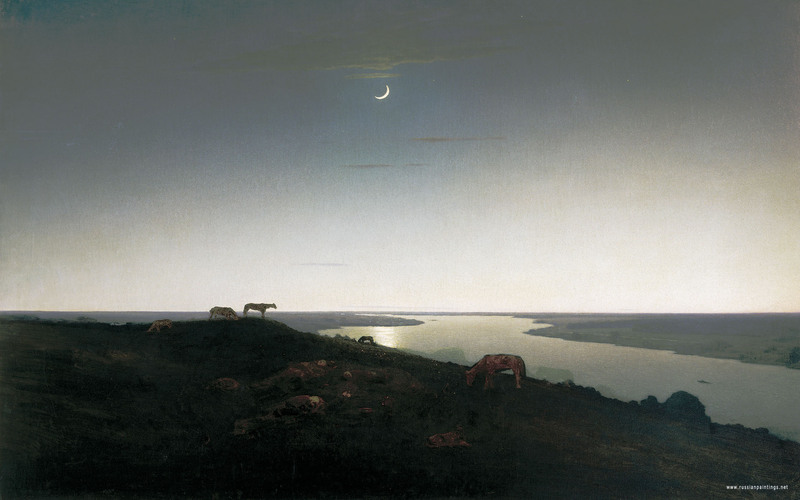 He dreamed of creating the common artistic image of his homeland in this painting. Levitan fell deeply in love with the Motherland as did all of the Itinerants. They dreamed and believed that their art would give people happiness and hope and recognition of the need to develop a high moral ideal in Russia. 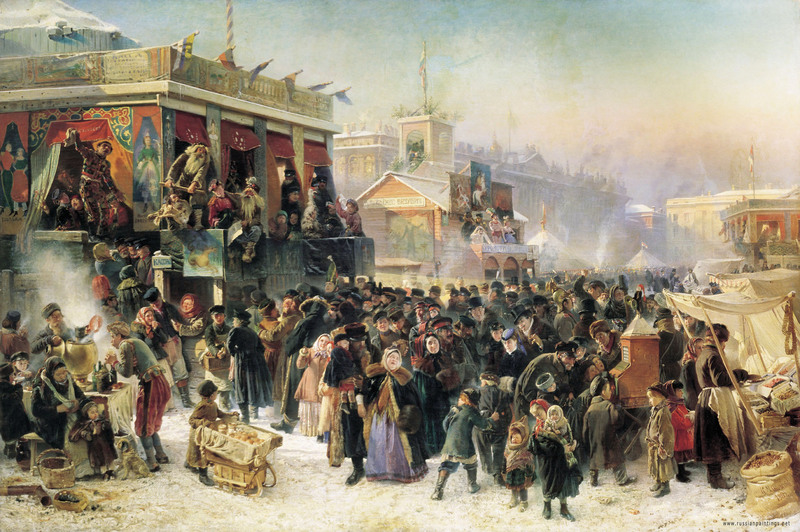 The Itinerants held sway over Russian art until the first ten years of the 20th Century. For me they will always be the best that Russian art has to offer. They painted in many styles, but they depicted life as they believed it was. They did this at great risk to themselves, and it is hoped that finally Russia stands on the golden threshold of freedom that they envisioned for her so many years ago.